While Britain's new tourist board, 'VisitBritain', starts to promote the UK as a 'happening' holiday destination, the latest Lonely Planet Guide describes it as one of the most beautiful islands on earth. Thanks to huge conservation efforts and stringent planning rules, we have thousands of miles of unspoilt coastline in Britain and Ireland  including some of the most stunning and dramatic in Europe. Marion Moore investigates what makes British beaches great  and the envy of many a villa-owning ex-pat whose once secluded place in the sun is now surrounded by endless coastal development. The seaside of the British Isles no longer resembles the clichés of the past. Chips with everything, fierce battle axes running B&Bs, sunburnt kids sucking sticks of rock are part of the imagery of a British seaside that has long gone. They existed in an era when people flocked abroad for a more 'glamorous' holiday. Now, the traditional kiss-me-quick seaside image is more prevalent in the Spanish costas than in the UK. It's true we can't always match the weather of southern Spain or the Greek islands, although actually these days it is rarely as bad here as you think  global warming has to pay some dividends  but there's never been a better time to enjoy a beach holiday in the British Isles. Local councils have made huge efforts to clean up their act, spurred on by two major initiatives  the European Blue Flag scheme and our own Seaside Awards. The former covers only the larger resorts; the latter, administered by the Tidy Britain Group, include many small, isolated rural beaches up and down the coast. Both schemes require beaches to be continually monitored through the summer months. Those which pass are permitted to fly the blue flag of the Europe-wide programme or the yellow and blue flag of the national Seaside Awards. More than 330 beaches have Seaside Award flags flying this summer  103 of them in Wales. If you see either flag, or both, rest assured the beach in question will have been critically assessed for at least a dozen different criteria  from the provision of lifeguards to assurances of water quality. A resort beach flying the blue flag will have been assessed across 29 criteria including the availability of cafés, public loos, parking and so on. Rural beaches may have none of these, but will still have to pass different checks concerned with sanitation and safety. The results are published in the Seaside Awards guide covering England, Wales, Scotland and Northern Ireland and updated each year. There is also an excellent website (www.encams.org). The best thing of all is that, with so many beaches to choose from, there is something for everyone. The sunny south west, particularly Devon and Cornwall, still provides the widest choice and so is perhaps the logical place to start in our round up of great beaches. Weston-super-Mare in Somerset, Weymouth in Dorset and Dawlish (Devon) are small town resorts offering a combination of clean sandy stretches, beachfront shops and amusements. 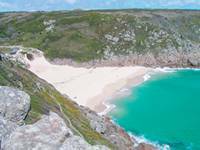 Elsewhere miles of magnificent unspoilt coastline mean it's still easy to find the dramatic coves and inlets favoured by fictional smugglers and the heroines of a thousand romantic novels. And there are dozens of idyllic fishing villages like Port Isaac and Marazion with its breathtaking views across to St Michael's Mount, larger Looe and Polperro plus fabulous Falmouth and trendy St Ives. Further round the coast, Wales, too, has a fantastic coastline, including that of Pembrokeshire, the UK's first coastal national park. It has huge cliffs and sandy bays, several small islands (such as Skokholm and Skomer whose names denote their Viking heritage), charming St David's, the Principality's smallest city, and some superb wildlife and walking country for hose so inclined. Further north, the Isle of Anglesey, with more than 125 miles of coastline, has at least two dozen award-winning beaches. One, Beaumaris, the site of Edward I's last and finest castle, also boasts an historic gaol with a soundproofed 'punishment room', a courthouse still in use after nearly 400 years and a summer festival of concerts and craft fairs. Popular Llandudno, with its generous three mile crescent flanked by the twin limestone headlands of the Great Orme and Little Orme, celebrates its Victorian past with a host of attractions and events held each year on its carefully preserved pier  all 2,295 feet of it. 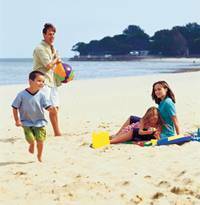 Returning south to Carmarthenshire, Pembrey Country Park has more than eight miles of golden sand and sand dunes. Wales has its fair share of quieter beaches too, of course, such as Mwnt and Cwmtydu in Ceredigion offering a pleasant mix of seclusion and stunning scenery. And at Tresaith, overlooking the waters of Cardigan Bay, visitors can enjoy a unique, bracing freshwater shower after swimming, courtesy of the River Saith which cascades over the cliffs and onto the beach. Further north, it takes a brave soul to swim in the seas off Scotland which, whilst clear and clean, are rather chilly. The vistas are magnificent, though, particularly on the west coast, and the broad flat beaches are perfect for walking or kicking a ball, exercising the family dog, or bird watching. Midges can be a problem here in early summer, but to my mind the blue-green of the sea off somewhere peaceful like Kintyre, the misty silhouettes of passing vessels and the sheer romance of the Highlands and islands more than make up for it. Scotland's east coast too has many unspoilt beaches, as does Northumberland (including haunting Holy Island, near Berwick-upon-Tweed). One of the most heartwarming environmental improvements of the last decade must surely be the slow restoration of County Durham�s beaches from coal tips (literally  huge conveyor belts used to dump the waste from the local mines over the cliffs) to their former golden glory. Yorkshire, too, has some marvellous beaches, including Robin Hood's Bay, while Lincolnshire boasts famously bracing Skegness. In East Anglia, sand mostly gives way to pebbles and shingle, leaving walkers better off than the bucket-and-spade brigade. The exceptions are mostly in North Norfolk, where there are some pleasant sandy beaches around the southern edges of The Wash. Families return each year in great numbers to some of the more popular East Anglian resorts and there's no doubt children love them: Aldeburgh, Southwold, Cromer and Sheringham continue to thrive. There are of course too many to list here let alone describe, but take to the sands of England, Scotland or Wales this year and you won't be disappointed. Children have always thrived on Britain's great beaches, and you will too.